The cellist played his anti-Trump Bach suites this wekend. I remember Trump looking very disconcerted as YoYo was playing the Bach at the Armastice ceremony in Paris, great that he’s doing it again. Is this Bach against Trump our modern day ‘Shostakovich against Stalin’?.. Oh probably. Yo Yo has ben so suppressed by the State. Bravo Yo Yo! I wonder if Herr Trumpf even knows who you are…..
he took part in a podium discussion about culture and really impressed me. And now this, he is an honorable man. P.T. Barnum would hire him in a second! A charming, but futile gesture. Who is this supposed to shame? The shouty, belligerent hippopotamus with the self-issued ;academic’ qualifications – who is masquerading as Secretary of State? The ‘genius’ who took small children away from their parents, and put them in cages? It’s not possible to shame people like Pompeo or Haspel by playing Bach (or any other composer). Pompeo is a Neanderthal hippo, immyne to any sense of shame, or feelings of humanity. Making America Grate Again. This is the image for which the USA is known all over the world now: But of course, Gina Haspel has never had children of her own. Too busy riding her broomstick. Could there be another reason for doing this besides shaming someone/ anyone? Such name calling Viola, some self loathing at work here I think. In former times, only the Christian saints had the ability to appear at different places at the same time, which is known, in theology, as ‘multiple presence’, resulting from a long life of piety and a diet of grasshoppers. It seems now that if you play cello over a long time, you can acquire that ability as well. The only other well-known performer with multiple presence is Valery Gergiev, who is often booked for guest appearances on two or three different venues in different countries on the same day. Bogus refulgences are not the answer to the problems of the rest of the world wanting to swamp first world nations, Yo Yo. Speaking of first world swamps, the New Yorker has an excellent articles series called “Swamp Chronicles”. The New Yorker is well known also for it’s legendary fact checking department. “I’ve lived my life at the borders.” Nice speech and a great tribute. Thank you Yo Yo Ma. It is very ironic: Ma as a privileged artist being able to fly to whatever country he is invited, in comparison to refugees fleeing despair and being stopped at borders, unable to reach a human place. In fact, Ma’s nonsensical ‘intervention’ is offensive and exploitative. probably he has no idea what he is doing. He’d turn up for the opening of a paper bag….another Yo would have been devastating- Yo Kitamura. Wow, I have mixed feelings about this. I sometimes think artists should stay out of politics (and vice versa), but opinions will be all over the map. Anyway, it’s a gutsy move and I’m sure he feels the need to take a moral stance. I too have mixed feelings, mostly leaning against political engagement. But a gesture is more focused on human rights than on politics, maybe it’s worth it. I feel this case meets that criterion. Gutsy? LOL!!! Such a risk this panderer took. Some talented people can be soooo stupid!!! Who cares about Ma’s political views?!? He is too well established to look for extra publicity, so it is sheer TDS stupidity and lack of political maturity. Reminds of Rostropovich playing at Berlin Wall. 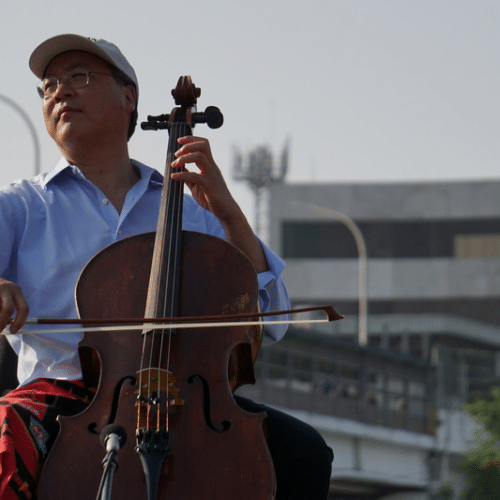 SHAME ON YOU, Yo Yo Ma!! A stupid TDS stunt. I’ve never heard a name for it, so I’m going to make one up: TDSDS (Trump Derangement Syndrome Derangement Syndrome, where voicing opposition or disapproval of anything to do with Trump is attributed to TDS). It’s a comic, but we commonly see analogs of it in comment threads. The 4 of you are a small community. Yes, but who cares that you don’t care? He clearly feels a need to do it. If it doesn’t interest you or offends you even, don’t pay it any attention. Whether such a gesture has any real effect or not is an entirely different question. Easy. I’d like to see him playing at the China-Tibet border. Soon to be the band for mayor Steve. Musical platitudes anyone? So sorry, I meant Mayor Pete. Funny how forgettable he is. How many illegal “families” [MS 13] is he bringing to his multimillion dollar apartment on Fifth Avenue? He lives in the Boston area. Do you know of a Manhattan apartment? Pity he could not play at Kate Steinle’s funeral. OooH Lookie, I got the Key to the City!